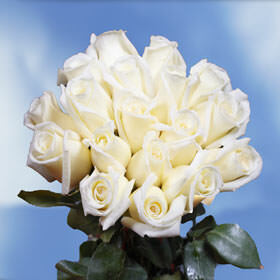 The Virginia White and Pink rose is a white based floret with a slight pink splash toward the edge of its petals. As pure and as beautiful as the name suggest, it is perfect for conveying the idea of love, romance, pureness, and admiration. With such great symbolism these florets can be welcomed at any event such as weddings, New Year's extravaganzas, and birthday parties. They are truly special because of their unique duo-color making them appropriate and fitting where you are unsure of which floret to use. Capable of growing blossoms all year round, our facilities are some of the most advanced in the industry. We can provide you with blossoms whenever you are in need to add beauty to your events. Aside from have the most cutting edge greenhouse we also make sure to safeguard the environment by following green procedures and practices. FedEx is our exclusive shipping partner and we know they will get you your parcel to where you need them in the USA on time and anywhere you need them. Also, all orders in the Mainland USA are free! When your White and Pink Rose order arrives to you, their buds will be closed and will need a minimum of seventy-two hours to bloom.